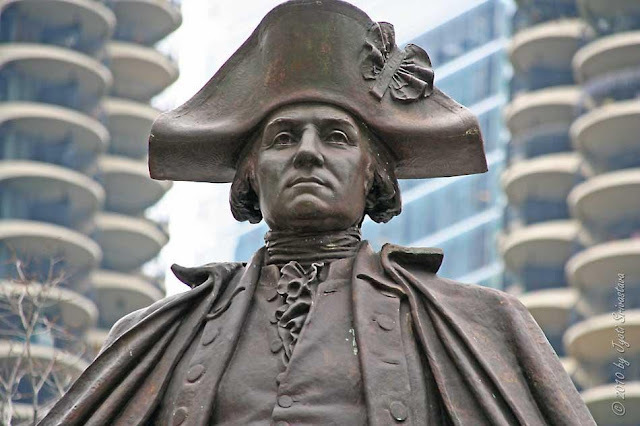 The Digital Research Library of Illinois History Journal™: The History of the Heald Square Monument at Wacker Drive and Wabash Avenue in Chicago, Illinois. The History of the Heald Square Monument at Wacker Drive and Wabash Avenue in Chicago, Illinois. 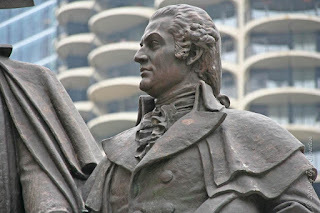 Chicago's Heald Square is named for Nathan Heald, an officer in the United States Army during the War of 1812 who was in charge of Fort Dearborn during the Battle of Fort Dearborn on August 15, 1812. Heald Square became part of the Chicago Park District in 1934, but the ownership was transferred to the City of Chicago in 1959. 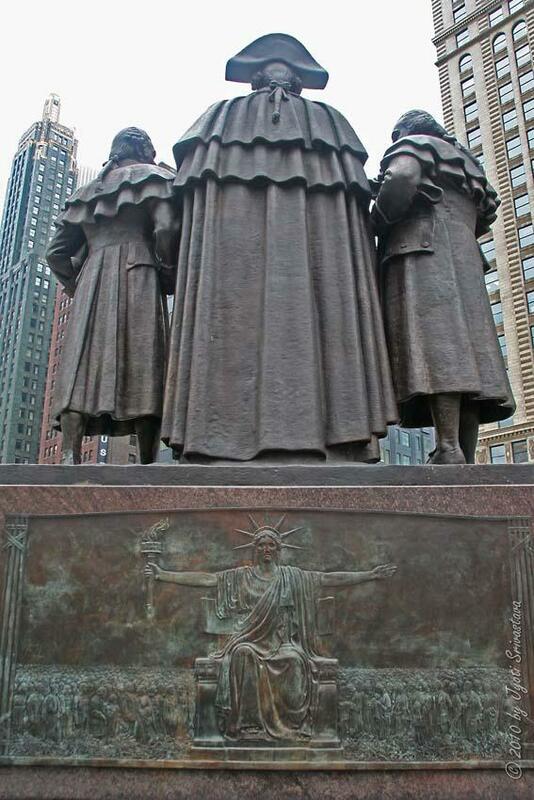 Lorado Taft's, Heald Square Monument is an 11 foot high bronze image of three Revolutionary War heroes standing on a six foot high granite base. 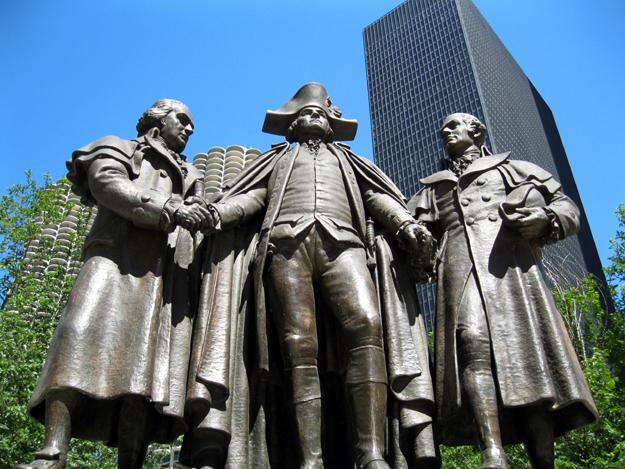 George Washington is the central figure and is flanked by Haym Salomon on his left and Robert Morris on his right. Robert Morris was a very wealthy and prominent businessman in Philadelphia. In 1776, he loaned $10,000 of his own money to the government when the Continental Army lacked the funds to continue fighting the war. He devised a plan for a National bank and submitted it to Congress in 1781. Morris was one of only two patriots to sign all three of the important founding documents of the United States: The Declaration of Independence, The Articles of Confederation, and The United States Constitution. Haym Salomon was born in Leszno, Poland, in 1740. His parents had been driven out of what is now Portugal by anti-Semitic laws decreed by the monarchy. When Salomon was a young man, he fled to Holland during a period of mob violence against Jews. Salomon immigrated to New York City in 1775 and became a financial broker. He sympathized with the anti-British forces and joined the Sons of Liberty. Salomon opened an office as a dealer of bills of exchange, bonds sold to provide funds for the Revolutionary War effort, and arranged for a loan to help George Washington pay his soldiers. Salomon and Morris collaborated to become effective brokers of bills of exchange to meet federal government expenses. Unfortunately, Salomon died penniless shortly after the Revolutionary War, having donated everything he owned to the war effort. Hodes, of Polish Jewish heritage, had read about the financial contributions that Jewish patriot Haym Salomon had made to the American Revolution and planned to honor him. 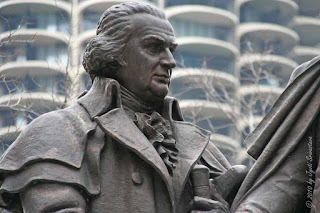 However, Hodes felt that a commemorative statue of Salomon standing alone would not deliver the message of inter-cultural cooperation as effectively as a sculpture with non-Jewish patriots like George Washington and Robert Morris. Barnet Hodes chose Lorado Taft to design the Heald Square Monument, and a campaign to raise $50,000 to complete the project was launched. Taft completed a small study model of the monument that depicted Robert Morris and Haym Salomon standing hand-in-hand with George Washington. Taft unfortunately died in 1936, but his work was completed by three of his students, Leonard Crunelle, Nellie Walker, and Mary Webster. 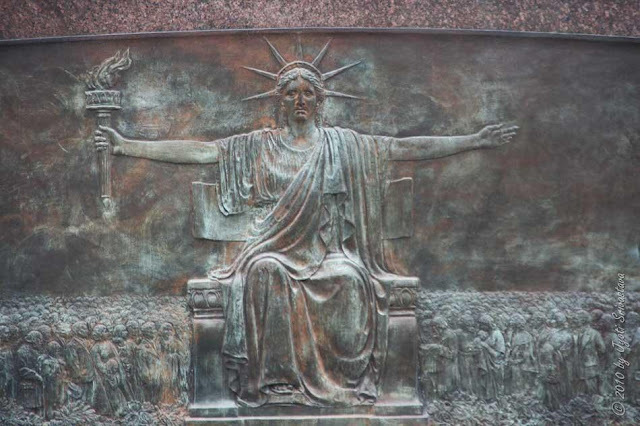 Taft designed this bronze plaque with Liberty stretching out her arms to welcome all people no matter their race and beliefs for the back of the base of the monument. The Heald Square Monument became the first sculpture designated as a Chicago Landmark by the Chicago City Council on September 15, 1971.